Hope! yes! Guacamole in a package, but you still have to assemble it! Maybe this won’t be so bad! 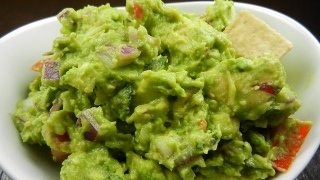 Plus, for $3.99 you’re getting much more than the 6-8 ounces of guacamole in all of the pre-packaged deals! Let’s try that! Today’s recipe comes from my pal, Holly Anderson. Holly was the one who asked me to be a part of the original Ladies(…) after bonding in the Deadspin/Defamer super collider and we’ve been friends ever since. These days you can find Holly running the big show over at SI’s The Campus Union where you can find her covering college football in a smart, funny and irreverent way that only she brings to the conversation (because college football needs more drama club stories). 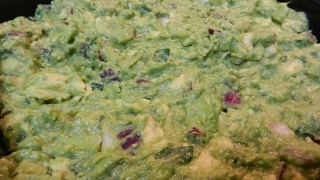 It came to no surprise to me that Holly’s guacamole would be the recipe submitted that was closest to my own. 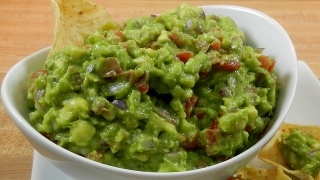 We share similar tastes in men, Pro Bowls, music and movies; of course our guacamole would be spiritual avocado cousins. What makes Holly’s guacamole special is the extra kick of lime zest, an addition that’s going to find a permanent home in my own guacamole from now on. The avocado comes alive in this recipe and isn’t buried behind heat. A purist’s delight. Today’s recipe comes from Becky, who I know from what back in the days when people commented on a Will Leitch run Deadspin. She’s funny, smart and like myself, very superstitious about her lucky game time snacks. I’ve named Becky’s guacamole “The Velvet Glove” because unlike Alyse’s Mango Serrano Guacamole last week where the sweet hit your palate before the heat, the heat of the chipotle smacks you right in the mouth before kissing you with refreshing mango. Today’s recipe was sent in from Ally Garner, hostess of Copacetic in Carolina and Southern Fried Football. Ally’s a UGA Bulldog by education and a ‘Bama fan by marriage, so if there is anything Ally knows, it’s tailgating. When she told me how much success she’d had this season with a pineapple and cucumber guacamole she had found via the Fearless Homemaker, I knew it I had to try it despite the unconventional ingredients. 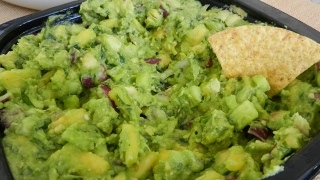 Pineapple and Cucumber Guacamole (Guacamole con Piña y Pepino) comes to us from chef Roberto Santibanez’s Truly Mexican: Essential Recipe and Techniques for Authentic Mexican Cooking, a book worth checking out for the mole recipes alone and a sharp looking apple tequila guacamole. Pineapple and cucumber add a nice crunch to the creamy avocado, onion and cilantro make a nice ying and yang of floral and tang, while the heat of a little extra jalapeno matches brings it all together nicely. To say it was a hit on Championship Sunday would be an understatement, people just couldn’t get enough of this wonderfully tart, sweet and hot guacamole. 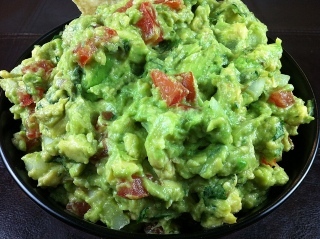 Today’s guacamole comes to us from Dan Rubenstein, co-host of the popular college football podcast, The Solid Verbal (which can also be found on the Grantland Network) and is one of young guns the Bleacher Report brought in as a featured columnist. If you’ve ever caught The Solid Verbal, you’ll know food comes up from time to time on the show, so the fact that Dan makes a mean guacamole shouldn’t come as a surprise to anyone. 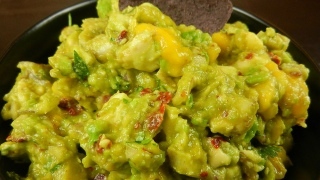 Tomatillo salsa gives the guacamole a bright taste and really brings out the natural green color in avocado while the hot sauce provides a smooth heat across the palate with each bite. As a native of Albuquerque, Josh has pretty strong opinions on tacos, salsas and of course, guacamole. If you’re not familiar with the taste of raw tomatillo, it’s a tart — almost sour, crunchy fruit. Once you remove the outer husk and clean off any remaining waxy residue, you’ll find a bright green firm berry. While I am a huge fan of roasted green tomatillo salsas and cut up in vegetable soup, I wasn’t sure how I’d like in my guacamole. I worried the tart would be too much and would overwhelm the delicate avocado. Fortunately my fears were completely unfounded, as the crunch of the tomatillo played nicely with the chopped onion and the sour flavor perfectly counterbalanced the sweet acidity of the tomato. Leaving the seeds in the jalapeno created the perfect amount of heat and just a light dusting of garlic powder made sure the avocado was never overpowered by the seasoning as can happen with too much minced raw garlic. And now? 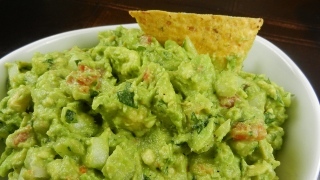 I know that he makes one of the best guacamoles I’ve ever tried. Smoky roasted garlic permeates the creamy avocado while the roasted habanero is the strong — but never overpowering – baseline in this guacamole. 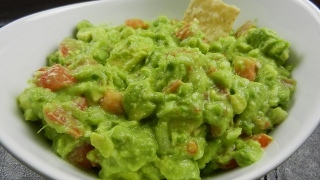 I have to admit, I had never heard of putting olive oil in guacamole until David’s recipe landed in my inbox. Then Alyse’s Mango Serrano Guacamole also called for olive oil. It’s been a revelation to this guacamole eater, as olive oil smooths out the balance between the heat of the peppers and tang of the tomatoes. 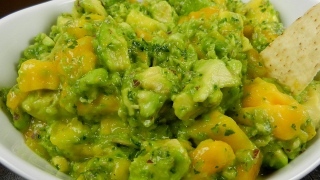 The creaminess of the avocado hits you first, then the sweet mango, onion and garlic and then there it is. The heat of the serrano pepper, which has you reaching for another chip immediately. Plus, since it has fruit in it you can say you’ve had a healthy Super Bowl treat (thus offsetting the extra grilled sausage you just ate). 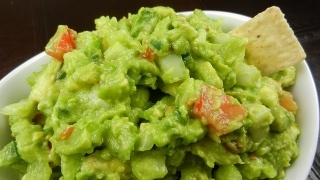 Don’t let the simple ingredients of this guacamole recipe fool you. At the first taste of Margery’s guacamole, my eyes lit up and I said to Bry, “This is the guacamole you want on a burger. It’s perfect.” Avocados are at the forefront where they belong, the garlic opens up nicely during the resting period and by using garlic salt instead of normal kosher salt, you don’t over do the seasoning. It’s thick, rich and incredibly fresh tasting without being tart, a problem that often arises when people put about twenty limes in their guacamole because they’re so afraid of it turning brown. Plus, this recipe requires you to make the guacamole a few ahead of time, which means you’re not racing around the kitchen fifteen minutes ahead of kickoff for your dip.